PLEASE READ THE FULL INSTRUCTIONS BEFORE YOU ASSEMBLE THE KIT! IT MAY LOOK EASY ENOUGH, BUT THERE ARE SOME PITFALLS. The Mini-Blinkenrocket is basically the same as its bigger sister the original Blinkenrocket, but smaller. So small it can be attached to your T-shirt with a magnet like a communicator from StarTrek. It features two buttons and Data-transmission via audio just like the original Blinkenrocket. Of course the design files, firmware and everything else is open source and available on github. Because of the smaller formfactor, smaller 0604 components are used and there is only a prepopulated PCB available. If you want to solder SMD yourself, please use the original Blinkenrocket kit instead. The idea of this kit is to make the Blinkenrocket as small and portable as possible while creating a kit for Solder-Beginners. We use a different Batteryconnector and a different Led-matrix than the original design, everything else is identical. Please start the assembly with the matrix. Make sure to insert it so that the label is on the right side where the text "matrix label" is printed on the Printed circuit board (PCB). Orientation is crucial and its not easy to fix this once soldered in place. The matrix is inserted on the side of the components and covers the Microcontroller (MCU). Once in place make sure to lay the PCB flat on the matrix and use the pliers to cut off the leads flat before soldering. This is unusual, but needed for this kit, otherwise the batteryholder wont sit flat. After cutting the leads its time to solder the 16 pins to the PCB. Doublecheck the orientation of the label on the matrix again please. Alrighty, solder the matrix and make sure there are no short circuits. 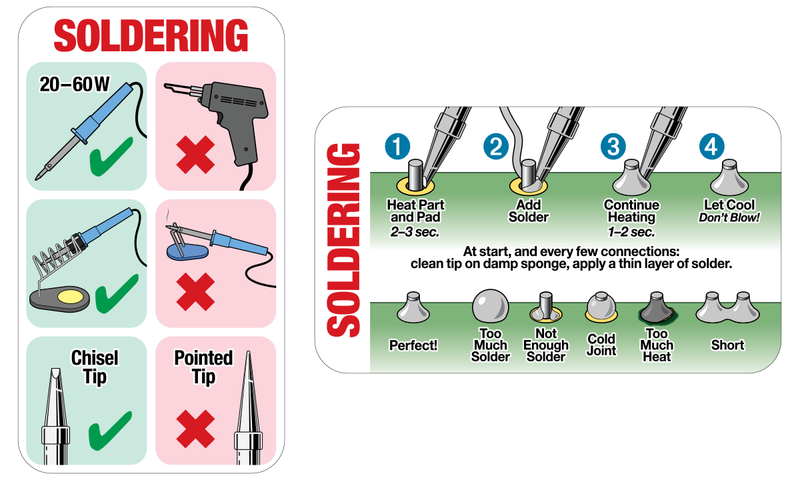 You don't know how to solder yet? Check out this cheatsheet from adafruit! Insert both buttons into the PCB. Make sure they sit flat. Before soldering the batteryholder in place make sure to REMOVE THE BATTERY and magnet first. The batteryholder is inserted from the backside of the PCB. While you CAN insert the batteryholder the wrong way its not very likely to happen. Just stick to the silkscreen or take a close look at the picture above. Once in place turn the PCB around and solder the two connectors in place. Make sure not to burn the matrix while doing so. We made a custom footprint for the batteryholder to provide as much space as possible for soldering. I suggest you start at the side that is easier accessible and solder the connector between the EEPROM and the matrix afterwards. Now is a good time to insert the battery and see if everything blinks as expected. If not you can still remove the batteryholder again and fix broken connections on the matrix. If everything looks good, remove the battery again and solder the Audioplug in place. Make sure that all five connections of the plug are soldered and there are no short circuits between the contacts. Enjoy your MINI-Blinkenrocket and wear it with proud.